Twitter to the rescue! Now that the conference is over, I have the tweets I posted (plus likes and retweets) to use as reflection prompts. 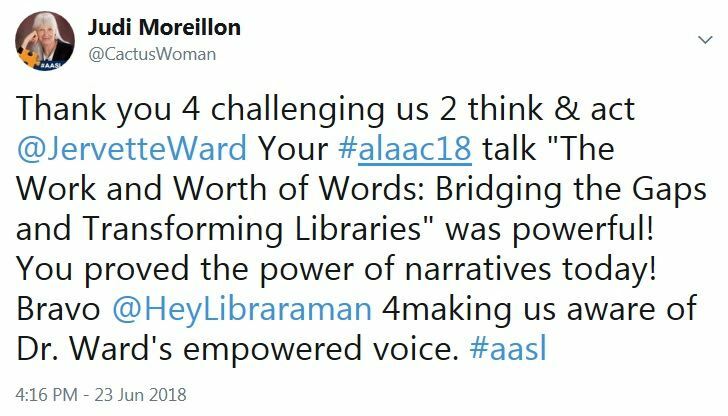 Since I began tweeting at conferences (nearly ten years ago), I have appreciated this social media platform as a tool for reflecting on whirlwinds of information and knowledge, especially for intense multiple-day conferences like the American Library Association Annual Conference, aka #alaac18. These are some of the highlights of my conference experience that may be of interest to readers of this blog. 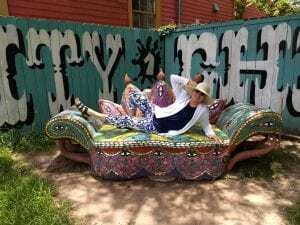 My visit to New Orleans began with a day and a half of learning and strategizing with the Lilead Project. For the past year, this group of 20 changemaker school librarian supervisors, five mentors, and three project administrators has been growing a community of practice. 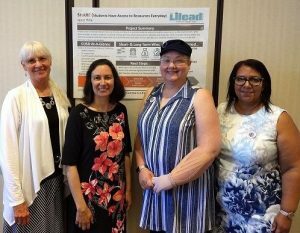 The work of the Lilead Project with school librarian supervisors is a vital component of leadership development and moving the school librarian profession forward. The Lilead Fellows put their knowledge into action in districts across the United States. I am proud to have served as a mentor for the West Coast Lilead group. We will continue to meet and support one another in the coming year. Left to right: Me, Jenny Takeda, Trish Henry, and Claudia Mason. 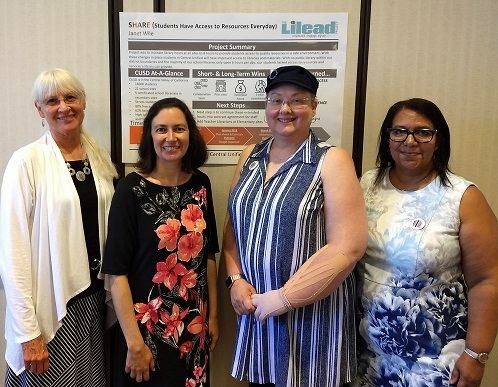 Since our colleague Janet Wile was unable to remain in New Orleans, the poster she created that illustrates her Lilead action plan/learning is standing in (inadequately) for her behind us. Hearing Mrs. Obama speak was a singular experience. Her strength, determination, poise, and most of all, her authenticity make her a leader and role model for many, including yours truly. I did not tweet or snap a photo during her interview with Librarian of Congress Carla Hayden. I was too star-struck so I especially appreciate those who did! 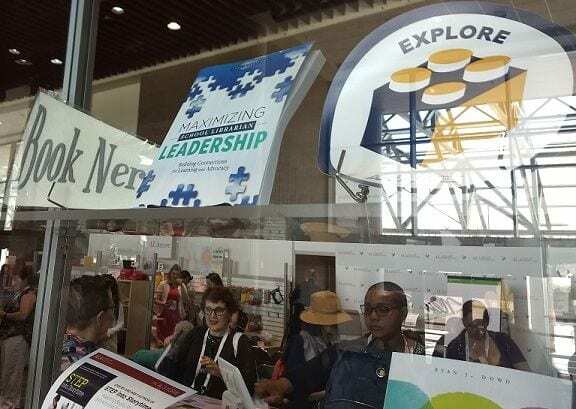 While standing in line to enter the auditorium, I was proud to see my hot-off-the-presses book, Maximizing School Librarian Leadership: Building Connections for Learning and Advocacy, displayed in the ALA Store. I especially appreciated and learned from school librarian leadership conversations with Misti Werle, Carolyn Foote, and Pam Harland at various points during the conference. Thank you, ALA Editions for your support and thank you to those who purchased the books before they sold out at the ALA Store. Part 1: More AASL members should attend this event! The award winners, many of whom brought family members and colleagues from their schools to share their achievement, gave inspirational speeches that captured the depth of their professional practice. I would like to spotlight the work the 2018 National School Library Media Program of the Year (SLMPY) Award recipients Mimi Marquet and Lisa Koch from Robert E. Lee High School in Springfield, Virginia. They even shared their speech in tandem! Such a powerful partnership! Thank you to Follett for sponsoring the SLMPY award. Part 2: Thank you AASL President Steven Yates for inviting Dr. Jervette Ward as the speaker for his AASL President’s Program. I agree with Dr. Ward that silence on issues related to social justice is not a neutral stance. Silence is a decision and in cases of social justice, it is a decision in favor of oppression. I have requested that my public library order her book Real Sister: Stereotypes, Respectability, and Black Women in Reality TV I look forward to reading it. The release of the 2018 Best Websites and 2018 Best Apps is a highlight of the annual conference. I appreciate the committee members who vet, annotate, and use these resources and tools in order to share the most effective ones with our colleagues. I was pleased to see the Stanford History Education Group on the Best Websites list. Civic learning is a hot topic in education, and this curriculum makes an outstanding contribution to this effort. I am not as familiar with apps, but I was excited to see Signed Stories among those listed. School librarians are charged with using and integrating tools that support literacy for all students. Thank you, AASL committees, for pointing the way. How wonderful to hear Lisa Morris-Wilkey’s news regarding her work with the Casa Grande (AZ) superintendent. Together, they are restoring elementary librarians positions. Brava, @LMWArizona! Mary Minow, Damaso Reyes, and Drs. Nicole Cooke and Joyce Valenza each had ten minutes to share a perspective on this timely topic. I wrote about this session in my 6/18/18 “News Based in Facts” post before I left for New Orleans. The panel provided a great deal of food for thought. I appreciated the legal information Mary Minow provided and learned more about the extremely high bar for successfully prosecuting libel, slander, and disinformation cases in court. Here are just few of my tweets related to the other panelists’ comments. My take-away from the panel is that information literacy and critical thinking are needed now more than ever. I completely agree with Joyce that stepping up our leadership in this area is essential for school librarians. And with support toward that goal, thank you especially, Damaso Reyes, for sharing your work with Checkology.org. The EveryLibrary.org event was a reminder that networking and advocacy are not only essential “work” for librarians, but they can also be fun! Thank you at EveryLibrary for a smashing evening. I especially enjoyed talking with Dorcas Hand (Texas) and Kathy Lester (Michigan) about their advocacy efforts (and the shrimp and corn were real good, too). 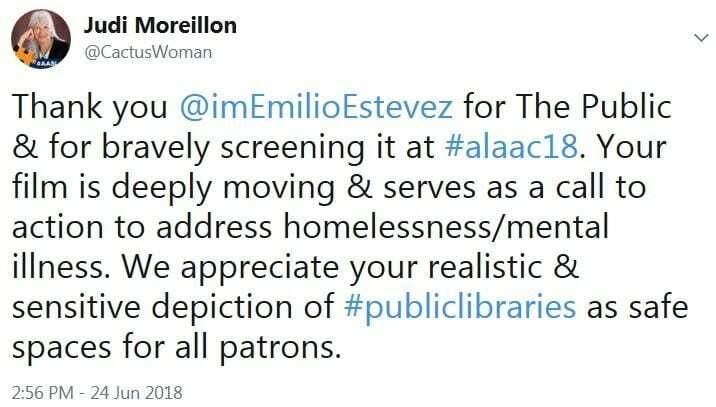 Our profession is indebted to Emilio Estevez for telling this story and shining a light on a little-known role of librarians and libraries in today’s society in his film The Public. If you did not have the opportunity to see the film at #alaac18, check out the trailer (no spoilers!) and know that the film is exceptional and the ending is perfect! I do hope Emilio Estevez succeeds with his mini-series. If so, I hope he will include the role school librarians and school librarians play in addressing literacy and technology-access gaps and meeting the needs of students, especially those living in poverty. For me, sharing the authors’ and illustrators’ inspiring speeches with friends is always a highlight of ALA Annual. It was so fitting that Jacqueline Woodson is the first recipient of the renamed and reconceived ALSC Children’s Literature Legacy Award. Ms. Woodson’s empowered speech was the perfect way to launch this award. View a short view of Ms. Woodson’s response to earning the award. 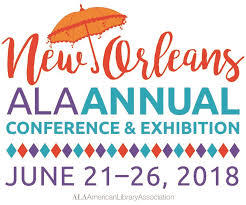 Read information about the name change on the ALA/ALSC website. 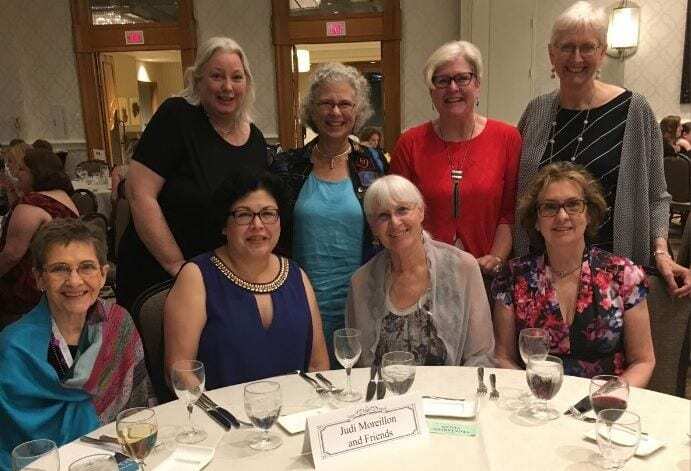 Our tablemate Audrey Cornelius snapped this photo at Table #51. Deb Levitov must have been visiting another table at the time the photo was taken. Front row: Connie Champlin, Becky Calzada, me, Pam Berger. Back row: Sheila MacDowell, Dorcas Hand, Karen Perry, and Barbara Stripling. And how fun that by an unexpected turn of events, Audrey, who was in my storytelling course at Texas Woman’s University in 2012, joined us at the table. Such a wonderful surprise! Scholastic Publishing invited Brian Selznick to draw the new covers for a Harry Potter 20th-anniversary paperback set book release. Thankfully, he said, “YES!” after creating a sketch that shows all seven book covers as a single poster. In this work, Brian explored the relationships between the characters and battle between good and evil. He used a snake to connect all seven covers. Brilliant! Preorder yours today! Thank you to ALSC President Nina Lindsay for bringing together this esteemed panel to share their research, experience, and perspectives. This is just a quick snippet from the many thought-provoking ideas and questions they raised. 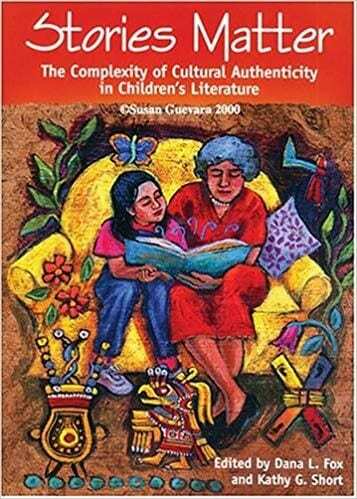 You can read about Dr. Debbie Reese’s reaction to name and description changes to the Children’s Literature Legacy Award on her website. Jason Reynolds asked this question: “Is it that Black boys don’t read, or is it that Black boys don’t have books to read—mirror books that they can see themselves in?” For many young Black men his Newbery honor book Long Way Down may be just that book. The continuing need for publishers to publish books from authors and illustrators from underrepresented groups was one take-away from this panel. This is not new, but all librarians can make a difference in how they develop library collections and serve ALL kids in their community. 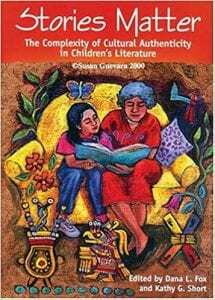 The need for increasing cultural competence among those who review, purchase, and share books is a critical aspect of today’s librarianship. The hashtag #alscallkids sums up a very complex and critical conversation. I started the morning of my last day in New Orleans with a walk to Café du Monde, Jackson Square, and the cathedral. After checkout, I had the opportunity to have lunch with a dear long-time friend who lives in the Big Easy. Darlene and I became friends in Tucson during our daughters’ challenging adolescent years. Catching up, eating at Morrow’s (we highly recommend the BBQ shrimp! ), shopping for grandchild gifts, and being silly together was the perfect way to wrap up this visit. 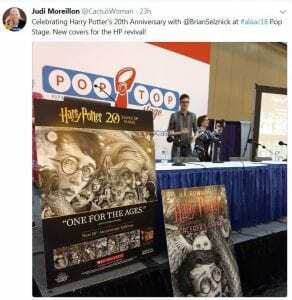 ALA Annual is truly about community for me. When I attend the Midwinter Meeting or the Annual Conference, I feel the camaraderie and excitement of learning with and from our nation-wide professional network. I especially appreciate the social justice and equity actions of our colleagues. I highly encourage you to get involved with our national association and its divisions. They are nothing without YOU! 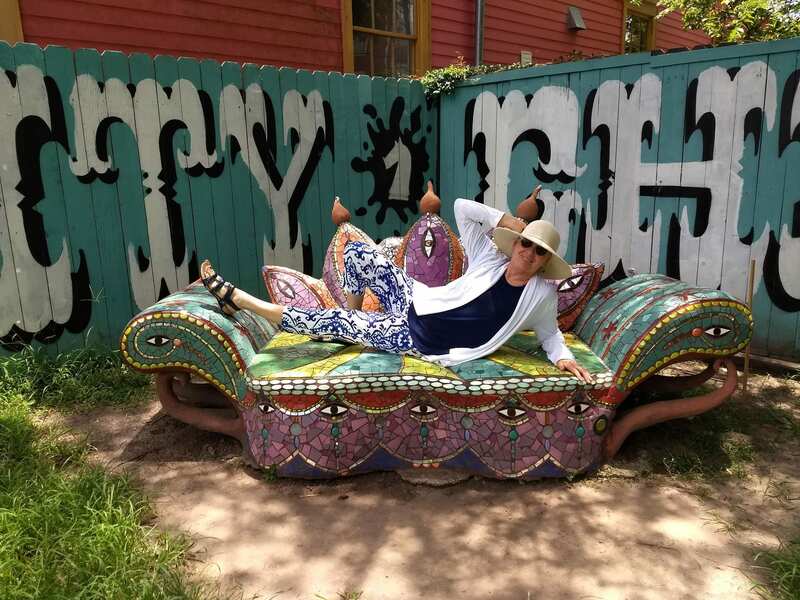 This entry was posted in AASL, ALA, Professional Development and tagged Community of Practice, Personal Learning Networks, professional development by Judi Moreillon. Bookmark the permalink.